← What does God have to say about having Dreams and Goals? 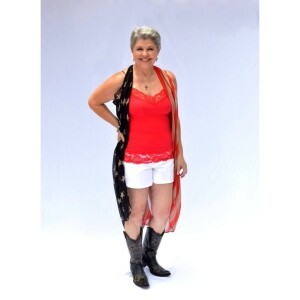 Carol is a Christian Country Recording Artist and Minster. Carol has been nominated for New Artist of the Year with HMG Nashville and Power Source. She will be traveling to Nashville to attend the ICMAwards this year in November. I hope you enjoy getting to know Carol a little better. Carol Hogner grew up in East Texas and was always singing, even if it was just her and her sisters singing songs while washing dishes. She sang in a group called The Spirituals as she was growing up. She then turned her focus to work and taking care of her 2 children Josh and Amber. As time went by she came back to singing with a strong passion for the Lord. She was singing at rodeo bible camp where her kids were attending and met Jeff Hogner. A short time later Carol and Jeff got married. Carol then gained 2 more daughters Hannah and Halee. As a family they traveled to team ropings ministering as Joshua Cowboy Ministries, for nearly 15 years. Her husband got his heavenly promotion 5 years ago. Now she continues to travel all over the United States and into Canada putting on church services and concerts. Her whitty, down to earth country personality captures all who encounter her. 1. Carol can you share with us a little about your cd Ordinary Things? Well I had been wanting to do a new CD for about 10 years. A couple id know for a lot of years called me up one day. They said they had some money they’d like to sow into my ministry and they’d like it to go toward making a new CD if at all possible. If not and I needed to use it somewhere else then that was ok too. Well that got the ball to rolling. When I had what I thought was enough money to go into the studio with I called a friend of mine. I asked him if he’s be interested in helping me with a new CD. He said I’ll do better than that I’ll introduce you to my cousins in Nashville that do that kind of thing. So his cousin Mark Johnson called me and we hit it off right away. Mark is not only a great musician and Aaron Tippin’s bass player and long time road manager he writes songs too. He asked me if I would like to have some original songs to record. I said let me think about it, lol YES I would love that. The first song I listened to was Ordinary Things and I cried like a baby. My husband had passed away just the year before. Through God’s favor I believe we were blessed to put out a very well produced CD. I couldn’t be more grateful. 2. I understand you released the single Ordinary Things with HMG. How has that been going for you? I was so thrilled when Mr. Gene Higgins called me that day. What a nice gentleman. I can say that I’m pleased with what we’ve accomplished together. Along with Ms. Darlene Fowler and my God Squad it was charting the first month. Again Thank you Jesus!! 3. I saw that you have been nominated in the top 10 for New Artist of the year for the ICM Awards, I bet your pretty excited about that? Oh my goodness excited is putting it mildly… I am ecstatic about. I feel like it’s just another way to share God’s amazing Love!! I want to thank all the DJ’s and fellow artists for making that happen, I’m so grateful. Well congratulations are in order for sure. I have few more questions so your listeners can get to know you a little better here. 4. What are some of your favorite songs that you perform? Ordinary Things, Faith, If I was Jesus, Hold Us Together and Won’t Let Go are just a few I love. 7. In your walk with Christ, what would you say the biggest miracle you have experienced is? Personally, my daughter survived a tumor in her jugular vein at age 11. I found that scripture about 10 years ago. For me it’s the perfect scripture for any occasion. I call it my life scripture. 9. Was there ever a time in your life when you felt like you were just ready to throw your hands up and give up? No I don’t think so. If I did it was a passing thought. I’m a fighter when it comes to giving up. 10. What hymns/gospel song would you say has impacted your walk the most? When I came back to The Lord after being out of His service got several years I heard “Pardon Me I’ve Been Pardoned”. I felt like if been set free. 11. Do you believe in the power of prayer? What has God revealed to you through prayer? I do believe prayer is very powerful. I’ve learned if we can take The Lord at His Word we put ourselves in a position to receive His blessings. 12. When you get to see Jesus face to face what do you think you would like to say to Him first? I think I’d just want to say thank you for all you’ve done for me Sir and I sure do love you! 13. Can you just share with us a bit about yourself that your listeners may not know about you? I grew up in the small Texas town of Malakoff. My sisters and I use to sing together at the kitchen sink while we did the dishes. I always wanted to be a singer. When I heard my first Christian Country radio station I cried. I didn’t know there was such a thing. I love country music so it fit me to a T. I travel around to team ropings sharing my Jesus with my songs and His Word. 15. What was your family life like growing up? I have two older sisters and a younger brother. We were a close family growing up. We were in church every time the doors were open. We didn’t have a lot of money but we didn’t realize it till we were grown. We had very loving parents. 16. What do you like to do in a time of leisure for fun or to relax? I love being a grandma. I spend as much time as I can as often as I can with my grand babies. I love to sing, work outside at the ranch, and build things out of wood. 17. What’s one random fun thing that your listeners don’t know about you? 18. What’s your favorite quote? 19. Do you have a favorite childhood memory? Going to visit my grandparent and my grandpa putting me up on his shoulders to go hunts eggs. 20. What was the funniest thing that has ever happened to you during your singing ministry? We use to have church outside under a big oak tree in our back yard. We had a quest preacher come in to speak. I got up to sing and her dog came and sat down in front of me. He then proceeded to drag his behind on the ground… We all lost our breath laughing. 21. What was the most embarrassing thing that has ever happened to you? I was singing the National Anthem at a team Roping in Kansas one morning. When I got to that high note a squeaked something terrible. Because of my love for that song and my country I was devastated. 24. What would you say your motto for life is…… Life’s too short not to have fun!!! I really enjoyed doing this interview with Carol. I have been watching Carol’s Dreams coming true one day at a time. I want to encourage you not to give up no matter what!! To listen to Carol’s music and keep up with where she will be you can go to her website. 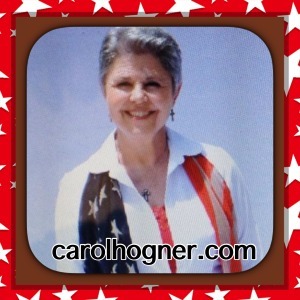 Thank you for taking the time to read this Interview with Carol Hogner. Please share with your family and friends. This entry was posted in Blog, Dreams, Faith, Family, Goals, God, informational, inspirational and tagged christiancountry, countrymusic, Dreams, Faith, God, ministry. Bookmark the permalink.